Philadelphia, PA – As part of the 250th anniversary of American independence, Governor Wolf joined Major League Baseball (MLB) to announce the Philadelphia Phillies will host the 2026 All-Star Game and related All-Star Week events. The governor joined Major League Baseball Commissioner Robert D. Manfred, Jr., Phillies Managing Partner John Middleton, current and former Phillies All-Stars, Mayor Jim Kenney and other local officials for the announcement near Independence Hall. This will be the fifth time the city has hosted the All-Star Game and the first at Citizens Bank Park. The 1976 All-Star Game was held at Veterans Stadium to mark the nation’s bicentennial. An estimated 100,000 fans will attend the multi-day event, providing an important boost for the region’s tourism and hospitality industry. 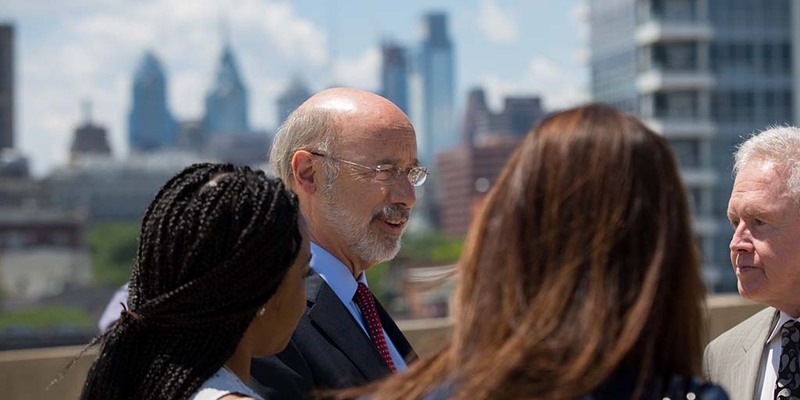 In preparation for the 250th anniversary of the nation’s independence, the legislature and Governor Wolf took action to create the Pennsylvania Semiquincentennial Commission in June 2018, becoming the second state to formally start the planning process. The governor appointed supermarket magnate and philanthropist Patrick Burns as chairman. The commission will engage people in all 67 counties to celebrate 250 years of commonwealth history and the contributions of all Pennsylvanians.